Shift Technology Solutions Cc T/A Mi-fone Namibia handed over equipment worth N$ 20 000 to the Namibian National Olympic Committee (NNOC) for the Queen’s Baton Relay yesterday. 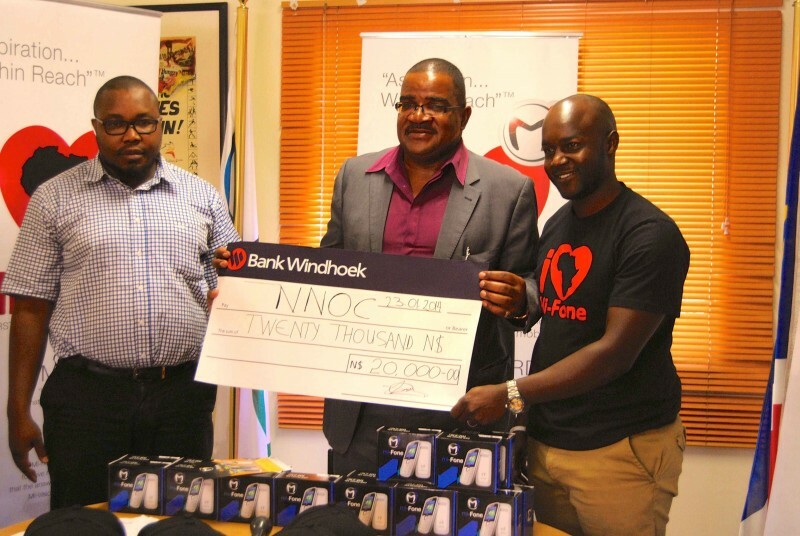 The sponsoring includes 20 Mi-Fone mobile phones, the first African brand now available on the Namibian market. The phones are aimed at allowing the NNOC to have better communication during the relay which is scheduled to take place in the capital on January 29th, 2014. “We decided to get involved with the NNOC and provide them with mobile phones for better communication during the Queen’s Baton Relay. Nowadays, technology and sports go hand-in-hand. We will allow the NNOC to keep the phones for the future to reach out people all over the world” said a delighted Victor Nzaramba, Managing Director Mi-Fone Namibia. Further equipment made available to NNOC includes T-shirts and caps. The provided material will make identification of official members of the relay much easier. The Baton touches down at the Hosea Kutako International on the 28th January where it will be greeted by members of the NNOC. The actual relay starts the following day in Pionierspark. From there it will move through the capital by various runners/walkers until it reaches the parliament gardens where it will be handed over to the Deputy Prime Minister, honorable Marco Hausiku. The Deputy Prime Minister will in turn hand the Baton over the Botswana’s ambassador to Namibia as Botswana marks the next stop of the relay.